As a government, we will serve all those that voted for us and those that did not, we will serve all the 45 million Kenyans equally. 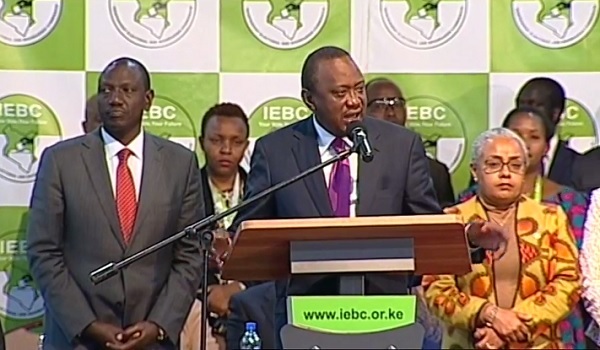 President Uhuru Kenyatta was on Friday night declared the winner of the August 08, 2017 election by the Electoral Commission Chairman, Chebukati with a 54.27% of the vote beating his closest rival, Raila Odinga who scored 44.74%. Uhuru got 8,203,290 votes while Raila got 6,726,224 votes. He immediately extended a friendship and partnership hand to NASA's Raila Odinga. "I would like to take this opportunity on my behalf and my family and deputy, first and foremost to thank God for the favor he has shown us and the people of Kenya for the confidence they showed in me, Thank you very much Kenya." "It's been a long wait, but we have been patient up to this time. I would like to thank all our supporters, staff, politicians, men and women who fought gallantly.To our competitors, we are not enemies. Like in any competition, there is a loser and a winner. I extend a hand of friendship and partnership as Kenyans want us to succeed, Asanti Sana." The very excited President left the podium and on the sides of Bomas of Kenya, he made another speech. "I extend a hand of friendship to our older brother, Raila Odinga and his supporters and also congratulate all those who won on the NASA ticket. This is a competition and does not result in enmity. We reach out to you and say that in any competition, there are winners and losers, but in Kenya, there are no losers." There's no single mind that can have all ideas, so we welcome your ideas. All Kenyans should exercise the peace that you have exhibited during the elections. There will be another election in five years again and people will compete, but Kenya will remain, so those who won and those who lost should reach out to each other and recognize that you are more important than any political organization. "Thank you for giving me and my administration to lead this country, to continue with the development agenda that we ave started and I shall do everything in my power to ensure that I leave this country a much better country than I found it."